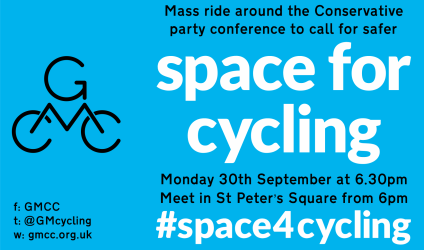 GMCC want as many people as possible to ride with us on our Space for Cycling ride this Monday, 30th September 2013, leaving St Peter’s Square at 6.30pm. We’re meeting from 6pm and there will be no motor traffic so we should have plenty of safe space. We’ll have a Dr Bike available from 6pm if your bike needs any minor adjustments before the ride, and we’ll have traffic police support, two bike mechanics and a trained first-aider on hand during the ride. The ride will initially go on the closed roads around the Conservative party conference, then we’ll pass Manchester Town Hall, Market Street, the Northern Quarter and Piccadilly before returning to St Peter’s Square. We should be finished by 8pm but it will be getting dark so please ensure you’ve got your lights. People should sign the petition even if you plan to ride with us too. We’re delivering a copy of the petition to an APPCG MP at lunchtime, then during the ride copies will be presented to a Conservative party representative, an executive MCC Councillor and a TfGM Councillor. We’d especially like people to sign the petition if they want to ride but currently don’t – we’ve organised this ride to represent the views of people who are concerned for their safety on busy roads, so please forward this information to any people you think might be interested. Please pledge your support using the petition, and encourage your friends to sign it too! There’s also a facebook page for the GMCC Space for Cycling event.